Representing the Point Pleasant YLA, pictured front row, from left, are Kayla Butler, Anna Litchfield, Avery Richardson, and Ashleigh Mayfield; back row, from left, Jacob Shull, Madeline Willcoxen, Kasey Lyons, Carson Taylor, and Nazar Abbas. Teens dedicated themselves to moving their communities and schools forward during three days of intensive instruction and interaction at West Virginia University (WVU) Jackson’s Mill. The annual Fall Leadership Conference, held Nov. 9 -Nov. 11, was presented by the Ohio-West Virginia Youth Leadership Association (YLA) in conjunction with youth empowerment speaker Chris Bowers. YLA encourages teens to become active and engaged in their communities through programs that promote civic responsibility and volunteerism. YLA staff and Chris Bowers inspired students to step up and become civic leaders. In small groups, participants identified community needs such as poor health and lack of civic participation, envisioned characteristics of an ideal community, and planned ongoing projects and initiatives to address issues and move forward to those ideal communities. “I feel ready to go out and make a difference in my community,” said Senior Tyler Smith of Waverly, Ohio. More than 60 students and adults attended the conference. 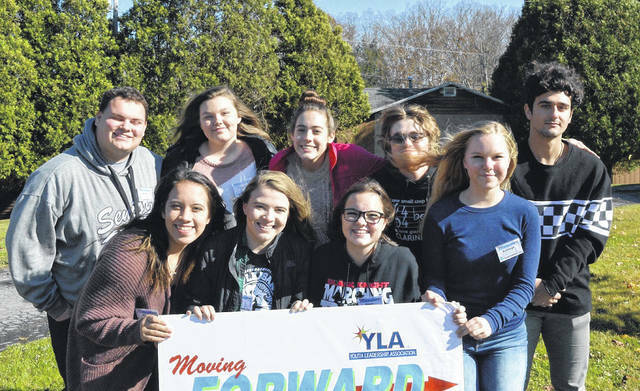 https://www.mydailyregister.com/wp-content/uploads/sites/24/2018/12/web1_PPYLA.jpgRepresenting the Point Pleasant YLA, pictured front row, from left, are Kayla Butler, Anna Litchfield, Avery Richardson, and Ashleigh Mayfield; back row, from left, Jacob Shull, Madeline Willcoxen, Kasey Lyons, Carson Taylor, and Nazar Abbas.